This projector is really spectacular, and its price is definitely worth if you’re a fan of great, quality home theater, since this projector will allow you to see images crystal clear. 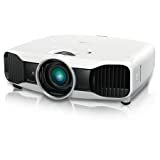 Also, its 3D projection is simply stunning, and if you are a video game lover and worried about lag, you will surely love this projector as there isn’t any difference in comparison to playing games on the regular TV. The Epson 5030UB will bring the movie theater experience in your home. With Epson’s Ultra Black (UB) technology as well as its 2400 lumens of brightness, sporting events, video games, and movies will virtually jump off the screen. This model of projector is really feature-rich and powerful. It boasts many improvements over its predecessor, and one of the biggest improvements is the contrast ratio (from 320,000:1 to Epson 5030UB’s 600,000:1). Not only does this projector look like a powerful, elegant, and more expensive device on the outside, but it performs like one on the inside too. It boasts an excellent picture quality, so 2D imagery is life-like and smooth with an overall dynamic range which makes the image jump off the screen. 2,400 lumens of brightness provide amazing images in a room with controlled light, and is more than able to hold its own in rooms with moderate light. Vertical and horizontal lens shift as well as a 2.1x zoom ratio provide setup flexibility in hard installation environments. And the performance benchmark (THX display certification) recognized by professionals and consumers, provides a film-like movie experience, and natural textures. And finally, we mustn’t forget to mention the included two pairs of RF 3D glasses, so you are always going to be ready for exciting and fun 3D experiences. Setting up this projector is unusually easy, thanks to its 2.1x zoom and its lens shift. The horizontal lens shift measures as a half screen width in any direction from the center position of the lens, and the vertical lens shift measures as a full-screen height down or up from the lens’s center position. This provides you with a wide range of options – right, left, down, and up – for placing this projector relative to the screen. Then you attune the lens shift to place the image to the appropriate position for the screen. Most of the connection options on the Epson 5030UB are standard fare: VGA component, two HDMI connectors, and composite video ports. However, thanks to WirelessHD, you can basically ignore all of these connectors on the projector itself. Just connect 1 to 5 video sources to this WirelessHD transmitter using HDMI cable, set the device to WirelessHD, and wait a moment until the projector and transmitter establish a connection. Also, the WirelessHD transmitter boasts one HDMI port that is MHL (Mobile High-Definition Link)-enabled, meaning it is extremely easy to connect an MHL-enabled tablet or phone to share images from your mobile device. While this projector is well-equipped with features that make it really easy to use and install, the primary draw of the Epson 5030UB is image quality. Its image in both 3D and 2D is one of the best out there, and the picture on screen makes it crystal clear where every single dollar of this projector’s purchase price went meaning it appears more expensive than it really is. This projector is built primarily for use in a home-theater environment that is light-controlled, and it is tailored to ensure maximum impact in that situation. As we already mentioned, the „UB“ in the projector’s name is short for Ultra Black, a designation which doesn’t disappoint once your projector is properly configured. In 2D, this projector’s image is life-like and smooth. Shadow detail is excellent, whilst highlights are bright, yet not blown out, and overall dynamic range actually makes the image seem three-dimensional. Once you turn the projector’s automatic iris on, black level is really deep. The color performance on this projector features comprehensive color adjustment controls and good color saturation. The factory configurations on the 5030UB require a little bit of fine-tuning; however this is usual in all home theater projectors. Moreover, this projector produces an engaging, bright 3D image which makes large screen three-dimensional display attainable. There are 3 dedicated 3D color modes on this projector which can be fine-tuned regardless of their 2D counterparts. Good shadow detail and well-saturated, bright colors make 3D viewing a really pleasant experience. If you still watch standard-definition content, technologies such as Super Resolution and Frame Interpolation enhance image quality of your DVD collections. Whilst no amount of image processing is able to turn standard-definition into high-definition, this projector is able to clean up any SD material enough to make it a lot easier on your eyes, now that you are used to HD. Frame Interpolation represents a technology which reduces the appearance of motion blur and judder by adding interstitial frames into a source video signal. Frame Interpolation boasts three settings, and an Off switch which starts out disabled. Low is the most conservative setting which doesn’t eliminate judder, but has the least perceptible digital video effect. The next setting is Normal, and it drastically reduces judder, yet can increase the appearance of digital video effect in some content. However, the appearance of DVE is highly content-specific. Some films show digital video effect on Low, whilst others don’t show much digital video effect even with FI set to High. You should probably leave Frame Interpolation set to Low since it is a safe all-purpose FI setting for reducing judder in majority of videos and films. The best reason to buy this projector, hands down, is its image quality. The 2D picture from the Epson 5030UB is impressively three-dimensional, high in contrast, and boasts spot-on accurate color after calibration. Detail is clear and sharp even without the usage of Super Resolution, even though that technology is able to make detail pop much more than it already does. Also, if you care strongly about 3D theater, this projector delivers a compelling experience. The 3D image from this projector is bright enough to show on large screens, and has almost zero crosstalk, and no noticeable flicker.